A son, Charles, was born to King Charles I and Henrietta Maria at St James’s Palace, London. He was styled Duke of Cornwall and Rothesay. Charles was baptised in the Chapel Royal at St James’s Palace by William Laud, Bishop of London. Charles’s sister, Mary, was born to Charles I and Henrietta Maria at St James’s Palace, London. Charles I was crowned King of Scotland at Holyrood Abbey, Edinburgh. He upset many Scottish lords by insisting that his coronation follow Anglican tradition. Charles’s brother, James, was born to Charles I and Henrietta Maria at St James’s Palace, London. Charles began his education. He was privately educated by personal tutors. Charles’s sister, Elizabeth, was born to Charles I and Henrietta Maria at St James’s Palace, London. Charles’s sister, Anne, was born to Charles I and Henrietta Maria at St James’s Palace, London. Charles was made a Knight of the Garter. He was also designated Prince of Wales and Earl of Chester. Charles’s sister, Catherine, was born to Charles I and Henrietta Maria at St James’s Palace, London. She died later that day. Charles’s brother, Henry, was born to Charles and Henrietta Maria at St James’s Palace, London. Charles’s father suggested a marriage between Charles and Catherine of Braganza. Negotiations between England and Portugal began but were ended with the outbreak of the English Civil War. Charles and his family moved from Whitehall to Hampton Court. Charles’s mother Henrietta Maria accompanied his sister, Mary to The Hague for her marriage to Prince William of Orange. While in the Netherlands Henrietta Maria raised funds to support the Royalist cause against Parliament’s increasing demands. Charles’s father raised his standard at Nottingham effectively declaring war against Parliament. The Puritan parliament ordered that all theatres be closed. Charles and his brother James joined their father in this battle against Parliament. The battle ended in stalemate with neither side able to advance. Charles’s mother returned to England landing in Yorkshire. Charles was resident at the Royalist capital, Oxford. Charles’s sister, Henrietta, was born to Charles I and Henrietta Maria at Bedford House, Exeter, England. This was the largest single battle of the Civil War involving 45,000 men. Although the Royalists led by Prince Rupert were outnumbered, they decided to fight. They were defeated by a Parliamentarian force led by the Earl of Leven. For the first time since the Civil War had begun Rupert’s cavalry were beaten by a Parliamentarian cavalry charge. The New Model Army lay siege to the Royalist capital of Oxford where King Charles was resident. However, he managed to escape dressed as a servant and fled to Scotland. King Charles I surrendered to the Scots at Newark and they took him north to Newcastle. Charles went to France, to the court of his cousin, Louis XIV where he hoped to raise support for his father to take the crown of England. The Puritan parliament ordered that Christmas was no longer to be celebrated with carols or feasting. King Charles I escaped imprisonment and fled to Carisbrooke Castle, Isle of Wight. King Charles I made a deal with Scotland whereby the Scots would invade England and help him to retake the throne. In return he agreed to change the religion of England to Presbyterianism. Charles left France and went to the court of his sister Mary and her husband William II of Orange at The Hague. This was a battle between the New Model Army commanded by Oliver Cromwell and a combined army of Royalists and Scots commanded by the Duke of Hamilton. The two day battle was won by Cromwell’s forces. Charles had managed to raise a Royalist force in The Hague but had been unable to reach Scotland before the Battle of Preston. Charles began a relationship with Lucy Walter. Charles began a relationship with Elizabeth Killigrew. King Charles I was tried for treason by a High Court of Justice specially set up for the trial. Many members of parliament secretly objected to the trial and stayed away. The court found Charles I guilty of using his power for personal interest rather than the good of the country and sentenced him to death. 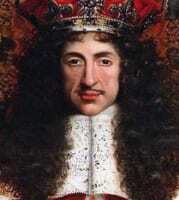 The Scottish parliament proclaimed Charles King Charles II of Scotland. The Scottish parliament wanted Charles to sign the Covenant and make Presbyterianism the religion of the British Isles but Charles refused. Instead he sent the Marquis of Montrose with a force to take control of Scotland. A son, James was born illegitimately to Charles and Lucy Walter in Rotterdam, Netherlands. This was a battle between the forces of the Marquis of Montrose and those of the Covenanter army. Montrose was defeated and executed. The defeat and execution of Montrose left Charles with no choice but to agree to the Convenanter’s terms. He signed the Covenant as soon as he landed at Moray. Although this pacified the Scots it reduced Charles’s support in England. The Scottish army was defeated by Oliver Cromwell’s forces and Cromwell took control of Edinburgh. Oliver Cromwell had taken control of much of southern Scotland. Charles II of Scotland managed to evade Cromwell’s forces and invaded England with the intent of capturing London. As soon as Cromwell realised Charles had gone south he left Scotland in pursuit. Cromwell met Charles II’s forces at Worcester. Cromwell secured victory. Charles managed to avoid being captured by hiding in an Oak tree. Charles continued to evade capture by Cromwell’s forces. Charles ended his relationship with Lucy Walter. Oliver Cromwell made alliances with France and Holland which meant that they would not support Charles. This was a treaty made between Philip IV of Spain and Charles. In return for Spanish support to regain the throne of Britain, Charles agreed to raise a force to support Spain against France. Charles began a relationship with Catherine Pegge. Large numbers of Royalists had joined the Spanish army in support of Charles’s alliance with Spain. This battle was fought against the English and French near Dunkirk, France. It was a decisive victory for the French and Charles lost nearly half of his army. General George Monck, Governor of Scotland, led an army to London where he persuaded parliament to hold elections. Charles began a relationship with Barbara Villiers. Charles was proclaimed King Charles II in Ireland. Charles was formally restored to the throne of Great Britain. The theatres re-opened and festivals were again celebrated after Charles reversed much of the legislation enacted during the Interregnum. This, as well as Charles’s reputation for enjoying a good time, earned Charles the nickname ‘The Merry Monarch’. As per the terms of the Declaration of Breda, this act created a general pardon for everyone who had committed crimes during the Civil War and Interregnum with the exception of those who had been involved in the execution of Charles I. A total of 49 people were liable for execution of whom 24 had already died. Some of those listed fled the country while others were executed in the following years. Charles’s brother, Henry, died of smallpox. Dutch representatives presented Charles with the ‘Dutch Gift’ a collection of 28 paintings and 12 sculptures. The Dutch wanted to be on good terms with the English. Edward Hyde, father of Anne Hyde who had married Charles’s brother, James, became Baron Hyde and served as Charles’s chief minister. Charles’s sister, Mary, died of smallpox. The bodies of Oliver Cromwell, Robert Blake, John Bradshaw and Henry Ireton were exhumed and given a posthumous execution. Charles’s chief minister, Edward Hyde, was created Earl of Clarendon. Parliament reconvened. It became known as the Cavalier Parliament. This act required that all holders of public offices in England had to be members of the Church of England. Catherine of Braganza arrived in England. However, Charles was not present to welcome his future bride. Charles married Catherine of Braganza who was a Catholic in a public Anglican ceremony. Charles sold Dunkirk to Louis XIV for around £375,000. This was not well received. Catherine of Braganza suffered a miscarriage. The English took control of Dutch colonies in West Africa. Charles’s illegitimate son, James, was created Duke of Monmouth. This act made it illegal for more than five people, other than family members, to worship together outside of the Church of England. The English attacked the Dutch fleet but failed to secure a victory. In retaliation for the English attack on the Dutch fleet, the Dutch opened fire on English warships in the Dutch colonies. The English used the Dutch opening fire on English warships as an excuse to declare war on the Dutch. New Amsterdam was renamed New York after Charles’s brother, James, Duke of York. A large Dutch fleet attacked an English fleet off the coast of Lowestoft. The battle was a victory for the English. Charles and Catherine left London for Salisbury to escape the Great Plague. Around 2000 people died from the plague during the last week of July. Through September around 7000 people died from the plague each week. Death figures for the disease began to fall. It was considered safe to return to London and Charles and the court returned to the city. Catherine of Braganza was delivered of a stillborn child. Charles began a relationship with the actress Moll Davis. This treaty ended the Second Anglo-Dutch War. The Dutch as victors were able to set terms and gained a monopoly on the trade in nutmeg. Charles blamed the Earl of Clarendon for the defeat in the Second Anglo-Dutch War and had him charged with treason. Clarendon fled to France. Charles agreed an alliance with the Netherlands and Sweden to oppose Louis XIV who, by the War of Devolution, was trying to take Habsburg land in the Netherlands for himself. The formation of the alliance led to Louis backing down. Charles gave Bombay, which he had gained from Portugal as part of his wife’s dowry, to the East India Company. Charles began a relationship with the actress Nell Gwyn. Charles ended his relationship with Moll Davis. Charles began a relationship with Louise de Kerouaille. Charles granted control of Hudson Bay to the Hudson’s Bay Company. Charles’s cousin, Prince Rupert of the Rhine was governor of the company. Charles signed this treaty with Louis XIV of France. It agreed an alliance against the Dutch with a secret agreement that Charles would receive a personal payment of £200,000 which he would use to help return England to Catholicism. Charles’s nephew, William III of Orange, asked Charles to pay back the money borrowed when he was in exile. Charles decided to try to get William on side by making him a part of the plot to return England to Catholicism but when Charles realised that William was a committed Protestant he abandoned the idea. Issued by Charles this declaration favoured the suspension of all laws against Catholics. The declaration was opposed by parliament who stated that the king had no right to suspend laws made by parliament. Charles openly supported Louis XIV against the Dutch and declared war on the Dutch. Charles’s advisor, Clifford, who had converted to Catholicism, resigned rather than denounce his faith. He committed suicide shortly afterwards. Charles ended his relationship with Barbara Villiers who had given him five children. Parliament refused to grant Charles any more money for the war which effectively forced Charles to abandon the war against the Dutch and to make peace. The power of the Cabal had reduced as Charles began to favour Lord Danby. Charles appointed John Flamsteed as Astronomer Royal. He was charged to find a method of calculating longitude. Lord Danby was charged with high treason for negotiating a secret alliance with Louis XIV. Although Danby stated that he had only negotiated the treaty because he was ordered to do so by Charles he was not believed. To save Danby from execution, Charles dissolved parliament. Charles ordered his brother James to leave England and go to Brussels. It was felt James was better out of England until the furore regarding the Popish Plot had blown over. Parliament reconvened. Most members of parliament were concerned that Charles would attempt to use the army to suppress parliament. Lord Danby resigned as Treasurer and Charles publicly pardoned him. However, parliament revoked the pardon. The House of Lords voted to exile Danby but the Commons thought it too mild. Eventually Danby was imprisoned in the Tower of London. News of the failed Rye House Plot leaked and Charles’s illegitimate son, the Duke of Monmouth, was implicated as being one of the conspirators. He fled England and sought refuge in the court of William III of Orange. Charles realised he was close to death and converted to Catholicism. He also requested that Nell Gwyn be provided for.